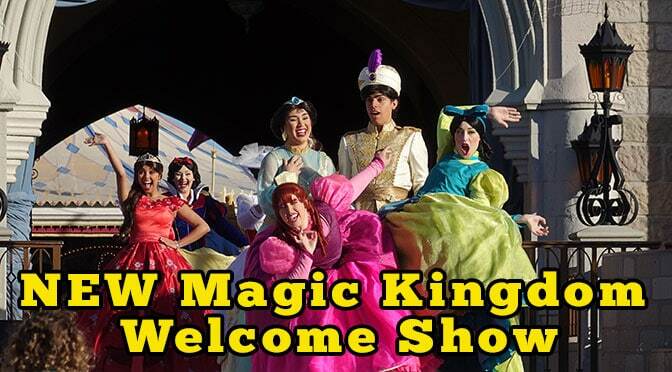 The NEW Magic Kingdom Welcome Show began today. It’s no longer being offered at the train station. Instead, you’ll be allowed to enter the park MUCH earlier and view the show from the Castle Stage. It’s an all-new show experience. Here’s the video as well as my thoughts on how it could affect touring the Magic Kingdom. What is different about the way guests can enter the park now? In past years, guests were held in the Mickey Floral area in front of the Main Street Train Station. Some would gather near the ropes and some would gather in the center for the show which featured a Main Street Citizen, Mickey Mouse and a train full of characters. 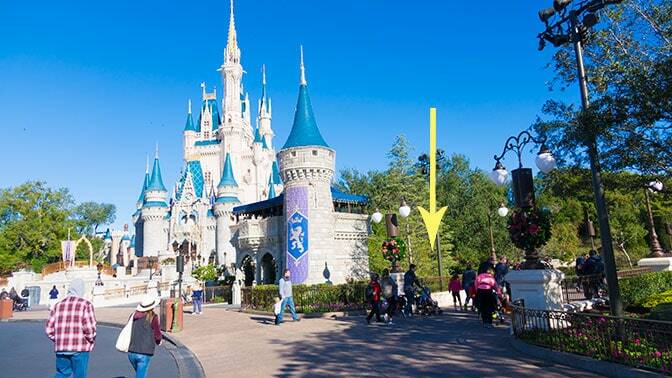 Guests are now allowed to freely stroll all the way up Main Street into the Castle hub area, but are restricted from entering the various lands by ropes. When are guests allowed to enter the park? Guests are now allowed to enter the park at 8am for a regular 9am opening. No word yet on days when the park opens earlier, but it’s expected to still open one hour earlier than REGULAR, non Extra Magic Hours scheduled opening. What is open once I enter the park? What about those special photos with the park totally empty? Unless you are one of the first guests to enter the park for a Dining reservation at 7:45am, you’ll not see an empty park. I did find it easy to take photos near the Castle between 9am and 10am with fewer guests around. Otherwise, you may want to stay until the park is closed and it is empty of guests at night. I have reservations for breakfast at Be Our Guest or Cinderella Castle, where do I go? You’ll make your way all the up Main Street. When you get to the hub area, turn left. You’ll be allowed to enter the special area for reservations and tours which is located to the far left next to the popcorn cart. You’ll then be allowed to walk up beside the Castle. In the picture below, you’ll see that the Liberty Square bridge is in the background. I have Extra Magic Hours priviledge, where should I go? You’ll enter the park as normal and then walk all the way up into the hub near the castle. The 2 spokes from the hub that are open to Extra Magic Hour guests are the one that leads to Mad Tea Party and the one that leads to Tomorrowland. A Cast Member will scan your MagicBand to verify that you have Extra Magic Hour access. Are characters still out during Extra Magic Hour? Princess Fairytale Hall, meet Ariel and meet Alice are definitely open during EMH. I need to confirm for Tinker Bell and Mickey Mouse. All other characters who meet in Town Square and the hub are not out during Extra Magic Hours. Can I still get onto 7 Dwarfs Mine Train a little early with breakfast reservations at Be Our Guest? Yes, they still allow guests who had a breakfast reservation to board the ride about 8:45am each day, so you might get in one or two rides before the mass of humanity arrives at 9:02 am. Are there other breakfast options available that don’t require reservations? Yes, you can grab a bit to eat at The Bakery (Starbucks) or Casey Corner. 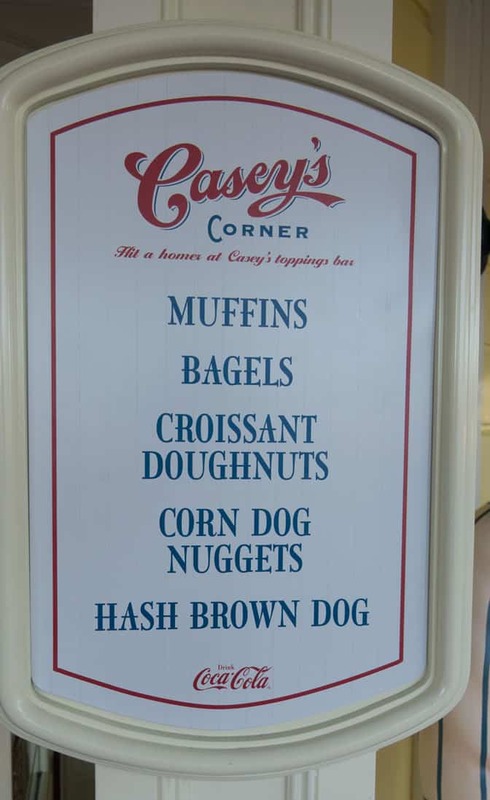 Casey Corner now offers Muffins, Bagels, Croissant Doughnuts, Corn Dog Nuggets and Hash Brown Dog. When will the New Welcome Show begin each day? The entertainment schedules have the show beginning at 8:55am each day. It even lists the show beginning at 8:55am on days with 8:00am Early Magic Hour. I’ll have to book a night at a hotel to verify that element. 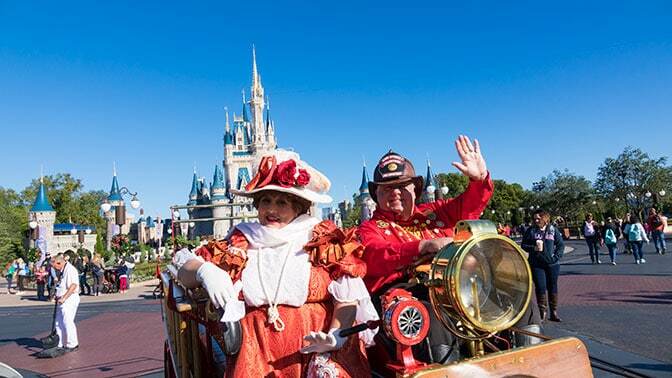 What is the new Magic Kingdom Welcome Show, dubbed “Let the Magic Begin,” like? What should I expect? The new show takes on more of a royal welcome than the traditional Main Street approach that was offered at the Train Station. Check out my video below. It’s less than 4 minutes long. The show begins with Sir Sterling, a member of the Royal Majesty Makers, welcoming the guests and realizing that it’s almost time to open the Magic Kingdom. He then introduces Mickey Mouse who welcomes his many friends including Aladdin & Jasmine, Anastasia & Drizella, Princess Tiana, Belle, Merida, Elena of Avalor, Mary Poppins, Alice, Snow White, Rapunzel, Pluto, Chip n Dale and of course Minnie Mouse. They all enter to the background music of Zip a dee doo dah. Mickey then says it’s time to start the day and the Fairy Godmother appears to teach us all the magic word that will open up the park. Where’s the best place to stand for the rides with the longest waits? Before I break it down by the most popular attractions, I’ll state that 8:30am was the prime time to be at the various ropes and the rope that leads to Seven Dwarfs the fastest had a humongous line by 9am! If you can get Seven Dwarf Mine Train Fastpass, do it! If not, you’ll need to follow this plan or go right before park closing. The line at park opening has always been bad, but this just made it worse. I recommend standing just to the right of the Castle. Stand at the rope that is heading up the pathway toward the Mad Tea Party. You’ll follow this path, then curve left for the Seven Dwarfs Mine Train. When I waited for the complete show, then put my camera away and casually walked to the Mine Train I found a line that extended all the way to Story Book Circus. That’s easily a 90 minute wait, despite the fact that the posted wait was 30, then 45 minutes. If you aren’t near the rope, you’ll wait a long time! You’ll want to stand at the rope that heads directly toward Tomorrowland and make your way directly toward the ride. The wait wasn’t terrible on the first day. It was more like 30 minutes shortly after opening, but still more than you’d like to wait, if you can avoid it. You’ll want to stand to the LEFT or RIGHT of the Castle stage and follow the ramp up beside the stage. When you reach the Prince Charming Carousel, turn left for Peter Pan’s Flight or right for the Princess Fairytale Hall. Is this just a temporary show while the WDW Railroad is being refurbished? From what I was told, this is the plan going forward. Nothing in WDW is permanent, but this is what is going to be offered to guests for the park opening. It seems, that unless there’s a lot of negative feedback, this is what guests will receive on a daily basis and the fun, dancing “Good Morning” show has now been retired and we move on to another era. My friend said to appreciate that we have SOMETHING as parks like Disneyland and Disneyland Paris don’t have anything. It appears that one of the most coveted moments in Walt Disney World has been cut. There was no special family on the stage with the characters. Do they still have the Citizens of Main Street and the Main Street Trolley Show? Yes, I saw Chief Smokey driving Victoria Trumpetto around in the Fire Engine this morning and then watched the full Trolley Show along Main Street. If I didn’t cover a question that you may have, feel free to leave it in the comments below or on my Facebook page. I may add your question to the post, if need be. SHARE the post so others can know! Could I get a breakfast ressie at Be Our Guest and still ride 7dmt early? Going to attempt to do EMH at 7:00AM on 12/22 (MVMCP day). Two quick questions… does that mean turnstiles open at 6AM (cringe as I type that)?? We are trying to knock out all of Fantasyland without FP; would you suggest 7DMT and then Peter Pan at rope drop or vice versa?? As always… Thanks!! I have 2 mornings at magic kingdom. One will be taking us to town square meet and greet for character greetings first thing. Should I save this new opening show for the other day (when we head to buzz light year and space mt first?) so I don’t have to backtrack back to town square hall? Or will it not make that much difference in time getting to this line? Thanks! Is this the most current information on the MK opening show/rope drop? Do you anticipate any changes in December? It hasn’t changed and it won’t change any time soon. Did you ever confirm whether Tink/Mickey Mouse still do meets during morning EMH? All the listings on http://www.characterlocator.com are correct. What is the earliest time I can get through security with extra magic hours starting at 8am? Thanks for all this info. What happens on a day where regular park hours start at 8am? Is there any benefit to having ADR BOG reservations at 8am? Would they let us in any earlier to be able to ride the Mine Train? Or would everyone enter at the same time? We have an 8:25 reservation for BOG breakfast the next to last Tuesday of October when the MK opens at 9AM. I was hoping for an earlier reservation but this is what we were able to get. Do you think there is a chance they will let us into Magic Kingdom and BOG on the early side so that we can finish our meal before 9AM? Planning to go to MK on 9/28, which is expected to be a very light crowd day. If we arrive for rope drop. What time to you recommend making the first fast pass for? Want to get as much in while the crowds are low before using our FP. We plan to use FP for 7 Dwarfs and Peter Pan…not sure on the other yet. You’ll need to schedule your FP 60 days in advance for those rides. You won’t get them in the park. If you have FP, you’re pretty much set, if you don’t save 7d and PPF until late at night. I guess it takes awhile to get a response on here? See below for march 9th . Was looking fir feedback. I’m thinking with ADR at CP for 8:10 we should linger at breakfast till after the show provided we get FP’s for PP, 7DMT and Winnie. Let all,the craziness get in. I guess if we don’t have FP then that another story or another day. Second option would be to go straight to Adventureland from CP which probably won’t be crowded at all. Crowd levels seem low for Week of April 23rd. Any thoughts? Thank you for great advice again, my family & I are going in May we’ve booked an ADR at BOG at 8.20. I’ll be honest we weren’t really fancying the food we just would have loved one if those sought after quiet pics in front of the castle, am I right in thinking this is a thing of the past, are we better cancelling our ADR & getting in the park at 8am any way to watch the show? My family and I are heading to MK next week. We have small children who will want to watch the opening show. Afterwards I’d like to head to Peter Pan. You mentioned a ramp beside the stage, will we be able to use it as soon as the show ends? Are the ramps easy to get to? Any extra insight would be helpful. Thanks! Do you know if the Mayor of Main Street is still there? Thanks for the update Kenny, we always like to do the emh at mk then hop to another park around 10 when it starts getting crowded. Good information! Kenny, I am having trouble getting your maps of Epcot and Hollywood studios to load this morning. The AK and MK maps load ok, but the other two are only displaying an address with .png when they pop up not the screen. The most important question though: what’s a hash brown dog? I think I need one! Who at Disney would we express disappointment about the Welcome Show not eventually returning to the train station? Can you provide an email address? On another note, on the Crowd calendar for the entire month of March, the Festival of Fantasy Parade is only on March 12 & 13. Is there some specific reason for this? Right I understand that its everyday, but is it open to every one? Is this early opening for guests that are not staying on Disney property? We like to be the first ones to ride the main street vehicles up to the castle right after the (train) welcome show. Do you know when the main street vehicles start running now? I hope they don’t discontinue them as well! Fantastic information Kenny! Thank you so much! #2, and most importantly, do you think I have time to pick up a Venti latte, and then queue up to be first in line to rope drop for Seven Dwarves? Thanks! What time does the monerail start running? Too sketchy to predict. It wasn’t running by 8am that morning. They do have ferries and buses as well. So if i have a ADR for BOG at 8:25am what time should I arrive? Like whats the earliest they would let me in? Im also thinking when to arrive at monerail now too. I was really hoping to get less people in my castle picture with my little one! Hey Kenny – love the site – How far down the path towards the Tea Party are the ropes set up? Are they quite a ways down, or closer up towards the Hub. We’re planning to get there right at 8 to be as close to the ropes as possible for 7DMT – will we be able to see ANY of the new show, or will it be completely cut off? It’s right at the hub. Thanks so very much for all that information! We’re not planning to go until maybe Feb. so hopefully the crowds are thinner then. So we are going on Friday to MK (against all advice to avoid EMH park) – with EMH at 8, how would this work for onsite vs off property guests? Will we be allowed in by 7? What do you think the procedure will be on days with extra magic hours from 8am-9am? Schedule still shows 8:55 show, so perhaps they have an EMH check in point? We’re planning to head straight to Merida at rope drop. Is it feasible to watch the show from a central vantage point, or is it critical to be as close to the rope as possible. I’d rather watch the show than be in the 7DMT stampede – wishful thinking? Thanks so much for all you do! How crowded was it for the castle show? Would you recommend getting there a whole hour early to get a good view of the show? Or were most people queueing up by the ropes? Planning on a trip in December with my parents for their first visit (side note: Mom uses a wheelchair.) I wanted to make a Pre-park breakfast reservation to try and get that nice family photo in front of the castle with no one in the background or at least close to no one. Now that they are allowing people to enter 1 hour prior to the park opening (9am), do you think it’s still worth it to make a DR for 8am, if it only gets you 10 mins “alone” with a hundred other families? Or do you suggest saving the $, getting to the park early to enter right at 8, snapping a pic, and then enjoying the show? The “empty” park has never been an attraction to me personally. We never minded having a person or two in background of our photos. That would be a matter of your choice. For BOG ADR can everyone get into Fantasyland right away? As in people with 8:45 ADR, do they get in at 8 or are they held at the hub until 8:30? Not sure about timing on that aspect. Thanks so much for the great information. Your website and posts are so helpful. Where did people line up for Adventureland and Frontierland attractions, such as the Jungle Cruise and Big Thunder Mountain? Thanks so much! Did characters still come out for meet and greets at the very front of the park? The ones that used to come out right after the welcome show as the masses poured in? I am excited that they are opening Main Street earlier! Glad we got to experience the ‘Good Morning’ show for the first (and likely last) time on our trip last year. Variety is the spice of life. I’m optimistic about this change. So if I had a 8am ADR at crystal palace am I still able to go ride seven dwarfs mine train at around 845? Were you able to get sorcerers cards right at 8am too? Do you think lines for tinker bell & mickey @ town square will be longer at park opening? with a pre-open ADR to Be Our Guest, is seven dwarfs mine train the only ride to open early around 8:45, or do they open the other rides (peter pan, pooh) early as well? Thanks for all this info! They usually allow people to sort of pre-line up at Pan or Princess meet, but may or may not open until park opening. Who are the people walking around the back of the castle during the show? Are those guests with early breakfast ADRs? This is so sad. We always loved the old show. And my dream of getting picked as Family of the Day is gone for good. Won’t be long until Smokey and the Citizens of Main Street are gone, as well. They don’t generate enough revenue or attract enough eyeballs. Scoop’s gone. The Citizens of Hollywood got dumped. So did GiTar Dan. Citizens of Hollywood are still there. They removed one (good) portion in the Hollywood Public Works team. I wonder how it will effect the morning magic ticket event? I may now cancel it. I think I will miss the Citizens of Main Street and the Good Morning song. Sad that they eliminated Good Morning right after Debbie Reynolds died too. So if the park opens at 9am and they are letting everyone in at 8am now and you have a 8am breakfast reservation at CP or BOG, is there still going to be a checkin line so that we can get in before 8am? Or are they just going to let everyone in at the same time knowing that you will be late to the 8am ressie? If they are letting everyone in at the same time now including the 8am reservation people, how much earlier than the 8am time will we have to get in line to be at the front of the pack to not be to late? Crystal Palace people just turn left and they are there. I detailed where to go for BOG and CRT. 8am entry for all is what happened today. I’ll continue watching to see if it changes. Can you enter Tomorrowland through the noodle station like before or do you have to go down to the main path to Tomorrowland? 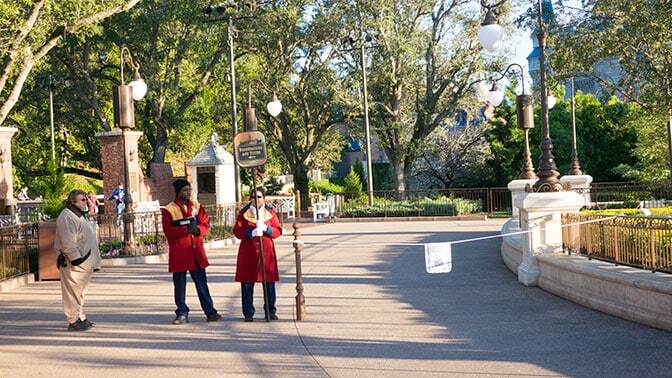 Not until they remove the rope in front of Plaza Restaurant. Faster to go to the entrance I mentioned. Thank you for the new information. My family tries to get a prepark opening reservation at Be Our Guest every time we visit. We are not huge fans of the food but we do it to be in the park early. Is that a waste now? Is there really no benefit to a pre park opening meal? Only benefit is to get to your first attraction a few minutes early. I’m sure they will direct EMM people through the reservations line I pointed out.